OBD Solutions stocks a complete line of standard OBD adapters that are available for immediate delivery, for a fraction of the cost of similar products. Contact us today to discuss your application, and request a quote. You can also visit OBDLink.com for advanced guides. If your application requires functionality not supported by our standard product line, OBD Solutions has the necessary expertise and resources to design a custom adapter that fits your needs. It is faster and more affordable than you think! Does your project need support for a protocol not listed above? 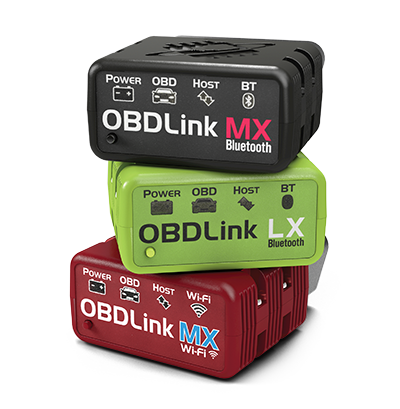 Visit the Custom OBD Adapters page to see how we can help. USB, accessible directly via a DLL or as a virtual COM port (VCP). Windows, MacOS, and Linux drivers are available. Bluetooth Class 1, with a line-of-sight range of 100 meters (330 feet). Wi-Fi (802.11b/g/n), a popular option for the Apple iPhone. If your project calls for the use of a different communication channel — be it Ethernet, RS-485, or two cans and a string — we can do it! We take pride in the quality of our OBD adapters. It gives us immense pleasure when customers praise our attention to detail, compliment the elegance of our circuit boards, and comment on how favorably our adapters compare to the competition. You can rest assured that we’ll never, ever, cut corners to save cost. Our adapters are carefully designed and engineered to maximize reliability and minimize manufacturing defects. They are assembled at ISO 9001 certified facilities using only the highest grade components. After assembly, each adapter is visually inspected and put through an automated multi-point test sequence that verifies the integrity and proper operation of the electronics and the firmware. It’s not just talk. When you buy from us, you will enjoy the peace of mind knowing that our adapters are covered by a 90-day money back guarantee, and a 3 year warranty — the best in the business.